Lee and I have been hard at work building and painting the first 500 points of our armies in time of the deadline at the end of the month at which point we shall attempt to kick each other’s faces in across a 4×4 board. Needless to say, a part of this adventure is looking at and reviewing the units featuring in our armies as we add to them. I kicked things off a little while ago with the review of the plastic Chaos Lord and so it seems only logical to next look at the main stay of most Warriors of Chaos armies…the Chaos Warriors. Now, the last time I owned a unit of Chaos Warriors they were the first multipart models to come out back in the days yo got piles of toys for £15. They had metal halberds, standard and champion weapons and just as I was getting out of the game those metals were replaced with plastic icons etc. They were, to a man, units of hunched, awkward, malnourished, looking fellows but at the time, they were the best basic models Chaos had going. But they were a bugger to build and rank up thanks, in part to the huge amount of freedom the old kit gave you. And because the standard-bearer and champion fell over with an unpleasant thud every time the unit was moved they were annoying to use too. So what of the ‘new’ kits? I appreciate they’re not new but they’re new to me and I’ve not properly looked at the before. Having the battalion box allowed me to compare the frames to the newer plastic knights and in that respect they’re showing their age. The new knights are extremely tightly packed by comparison. Either way, you get 12 blokes for your money which for Chaos Warriors is more than enough to kick face. I did get myself the box of three warriors to juice the unit to a full 15 but that’s another story. The most obvious thing about the kits is they are a colossal, massive, giant zero gravity leap forward from the last kit. For a start they’re standing up straight so that’s an improvement. They’re also much easier to build. The difference between the old kits and the new is that you only have to worry about sticking hands holding weapons and shields into sockets set into the torso. The up shot is that aside from looking fantastically intimidating, they all rank up very nicely together. It gives gamers the options of building units with a hand weapon and shield or two hand weapons. There’s also enough axes and other blunt instruments to make the units suitably Khorne, which is good news for me. However, the stiff ranks and limited weapon and shield options do, on the surface, can make the warriors a bit faceless and repetitive. But that too has its advantages, especially as hordes of Chaos Warriors should be faceless and repetitive. It also means that once you’ve got your colours and technique down you can smash through a unit in a weekend, providing there are no interruptions. However, with a slight adjustment of a weapon or the turn of the head you can add in the subtle variations across the unit which tell a story far greater than one would expect. 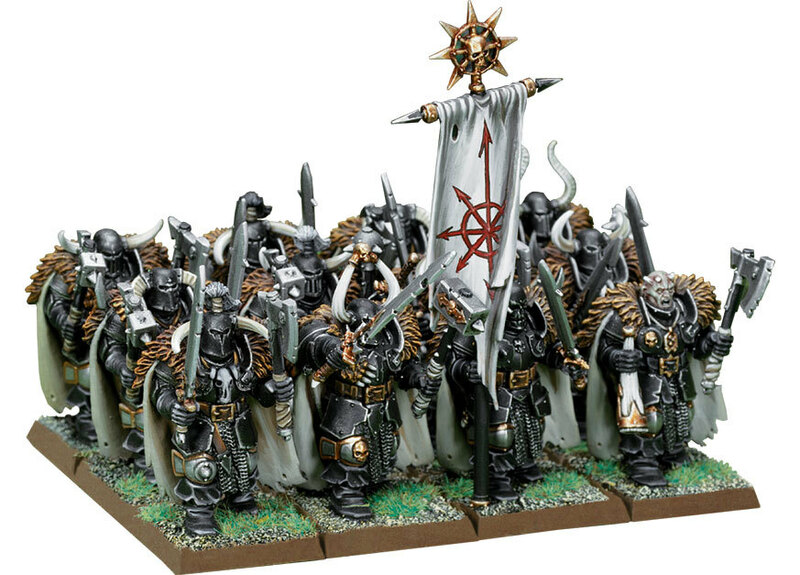 The look of the Chaos Warriors are a nice evolution and find the balance between knights on foot from a time past and group of double hard bastards with the winds of foul Gods at their backs. The broad stance, when ranked up, give off an implacable feel that promises extreme and unrelenting violence, weapons held up before them almost mechanical in nature just adds to the menace. But my favourite part of the Chaos Warrior kit, buy a mile, are the helmets. They’re an evolution not only of the helmets from the previous metal kits but all the Chaos Warrior models that came before it and, obviously, the metal knights that replaced the truly rubbish metal/plastic regiments that came out at the same time as the old Chaos Warrior box. Some feel more Chaotic in nature, others are the warping the helms of the warriors of the North. There’s that perfect blend of hand-made and warp spawned influence. And those heads go a surprisingly long way to giving the models their intimidating feel over all the other components. Because of the simple design and build the models are straight forward enough to paint with the shields, heads and detailing on the armour offering up enough variation that you won’t go completely mental building and painting them. In game terms Chaos Warriors couldn’t be more essential if you tried especially with the new rules surrounding initiative and the fact that Chaos Warriors are initiative 5. And they have 2 attacks. Or, in my case, 3. With the right load out, at the right moment, Chaos Warriors would crush just about anything they come into contact with from any core section of any army book in the game. But 14 points a model, plus upgrades, one would bloody well hope so. They’ve also got Chaos armour back – something that was taken out of the last Chaos book I owned – so they’ll be difficult to kill. Which is nice. The Chaos Warriors box is a brilliant kit with some nicely sculpted and intelligently designed models inside. They are hands down my favourite regiment box in the entire Fantasy range. It was these models that had me fixed on doing a Chaos army the second Lee and I discussed A Tale of Two Gamers. And seeing as they’re such a brutal and immovable core unit for my army, I couldn’t be more pleased with them. The Chaos Warriors box is available from Firestorm Games priced £18.00.